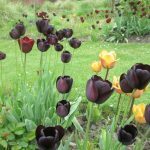 We highly recommend a visit in April to The Garden Show at Firle Place. 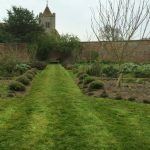 We especially recommend seeing the Firle Place Herb Garden. This year the show happening from Friday 20th to Sunday 22nd April. We’ve been visiting this show ever since we based our landscaping company in lovely Lewes. The show is a great opportunity to meet up with horticultural experts, support local plant growers and get inspiration about your garden, garden design and garden landscaping too. With a good dosing of fine tea, local arts and crafts and lashings of cake – what’s not to like. If you have little ones, there is also lots of fun to be had with relaxed and often times past themed play and entertainment areas. There will be garden doctors available to solve any plant problems you have. 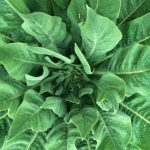 From identifying pests and diseases to advising you about right plant, right place for your garden. On Saturday and Sunday there will also be the ‘Fantastical Pirate Treasure & Easter Egg Hunt’ for litte ones based in the Firle church yard at 2pm -Easter eggs after Easter – what could be better! Visit The Firle Place website more information and links to get tickets. Looking for garden design inspiration? 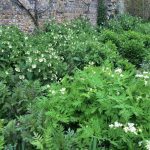 My top tip is to make sure you visit The Firle Place Herb Garden while you are at the show. 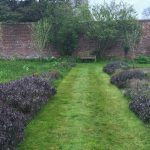 The herb garden is located within the stunning 18th century walled garden. I was told that it is compartmentalised by the different areas of the body that certain herbs are used to treat. An interesting way to approach garden design. 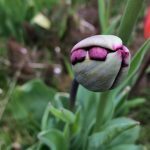 This area of plant medicine is one I am really interested in so this ticks many boxes for me. 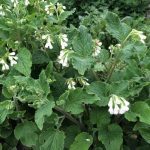 See my power of plants blog which focuses on this further to find out more. 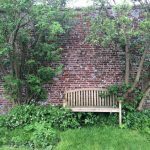 The garden in its current form is now in its third year of growth and we are really looking forward to seeing how the herb garden has matured and what changes and additions have been made. 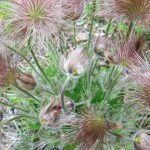 My biggest delight last year was discovering what Pulsatilla vulgaris (pasque flower) looked like and falling head over heals in love with it. The foliage is silky and divided and is topped with purple flowers with yellow centres. These turn into strikingly delicate seed heads. What I love about this plant is its combination of seed heads and blooming flowers on the upright stems of the same plant. These plants are also tolerant of drought once established so a winner in my eyes. 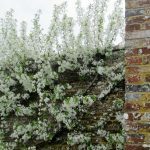 So great to discover these lovely plants, in bloom and thriving in Firle. 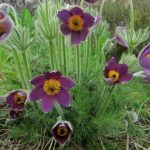 Pulsatilla has always had an association with Easter and I have read somewhere that it is supposed to flower on Good Friday. Be interesting to see how our dis-arming weather of late will effect its blooming date! 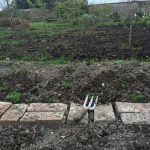 Still in development, some areas of the garden are quite sparse, in need of weeding, or waiting for perennials to wake fully, the tips of their growth only just evident. 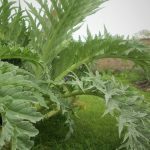 The scattering of tulips throughout the space with the bold foliage of Cynara cardunculus (Cardoon) really gives a cohesion to the garden. 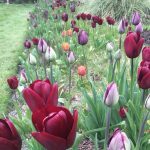 April is the perfect time to see these tulips at their best, I can’t wait to see any new additions. There is something refreshing about going to a Garden Show where the garden you see is a real working garden, taking it’s time to develop and establish. The Firle Gardeners were on hand last year to answer any questions. I always get the best tips from the gardeners in a place like this. I find gardeners of this type of gradual project always really willing to share their immense horticultural and practical knowledge. 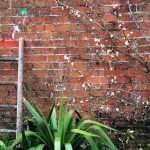 The main hard landscaping feature of this garden is the exquisite boundary wall. 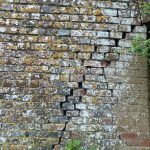 It is clear that in places it is feeling the effect of its age and quite literally showing its cracks. However, it has such a beautiful tone of brick and is the perfect frame for the plants. 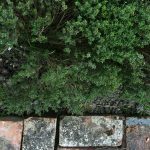 There are also some lovely simple and old fashioned garden landscaping elements, which are a perfect light touch, bricks and stepping stones work perfectly with the mown pathways. They give structure to the herb planting beds which are the essence of this beautiful place. 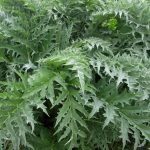 There are a number of stalls selling unusual and rare plants, so a good opportunity to be inspired and create your own herb garden. 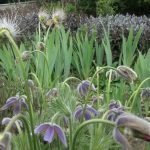 Five years ago we were also lucky enough to get the unique opportunity to go on a tour of the restoration project of the pleasure grounds at Firle, led by Philip Fenech, head gardener. 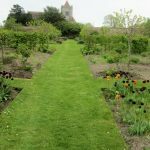 See my musings on the Firle garden pleasure grounds tour here and do look out for any further tours planned, they are really worth it. 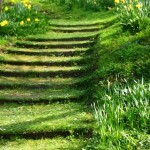 The beautiful turf steps are a real favourite.